U.S. auto sales hit record levels last year. Automakers are reporting huge profits. So, why did so many auto stocks get clobbered last month? Here's the reason. If you own shares of just about any automaker, January was an especially brutal month. Nearly all of the big names were down 10% or more. It didn't seem to matter that 2015 was a record year for auto sales in the U.S., or that several of those beaten-up automakers reported record profits for 2015. Actually, it did matter. Some investors think new sales records are a sell signal. Here's why. 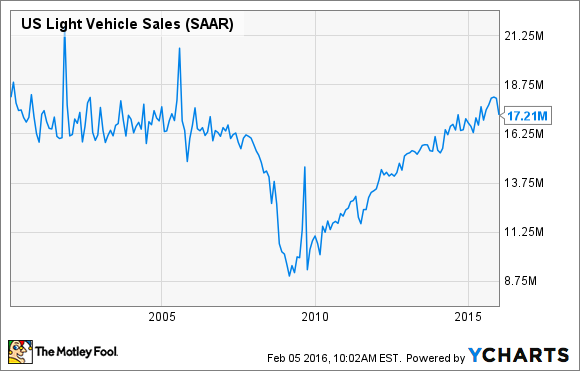 Here's the thing: Auto sales are cyclical. They rise when the economy is on an upswing and consumers are feeling confident, and they fall when that confidence ebbs and the economy dips into recession. U.S. Light Vehicle Sales data by YCharts. As you can see, U.S. auto sales plateaued at a high level in the years before the 2008 economic crisis. Sales in 2015 exceeded that high level, setting an all-time record. That has investors worried. 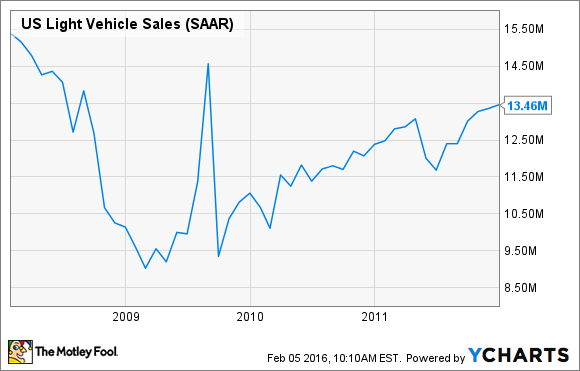 The cyclicality of auto sales means automakers' profits are also cyclical. Generally speaking, their profits rise and fall with those sales cycles. Historically, many have even swung from profits to quarterly losses during downturns. Automakers have extremely high fixed costs: Factories and tooling need to be paid for whether the factory is running at full speed, or much slower. In addition, to stay competitive, automakers constantly need to spend big sums developing future products, no matter what the economy is doing at any given moment. A new vehicle can cost a billion dollars or more to develop and put into production, and all of that money has to be spent before the automaker sells a single car. Long story short, automakers' profits are dependent on incremental sales above a fairly high level, because they have to sell a lot of cars and trucks just to break even. And as their profits go, so go their stock prices. In past cycles, automakers like Ford (NYSE:F) and General Motors (NYSE:GM) have seen their earnings swing to losses as the industrywide pace of sales fell. That probably won't happen during the next recession. Both now say that their costs have been restructured such that they should remain profitable as long as the pace of U.S. auto sales stays above the level we'd expect to see at the trough of a very deep recession. Toyota (NYSE:TM), with operations that are well diversified around the world (and with less exposure to China than Ford or GM), is also likely to cruise through the next recession -- though its profits would also get squeezed. Specifically, Ford and GM say they're likely to remain profitable as long as the annualized rate of light-vehicle sales in the U.S. stays above 10.5 million. How likely is that? Take a closer look at what happened to U.S. light vehicle sales between 2008 and 2011. The pace of U.S. light vehicle sales (called the "SAAR," for seasonally adjusted annualized rate) fell below that critical 10.5 million line for several months in 2009, and then again in February of 2010. That was the trough of an exceptionally deep recession. But note that even in that exceptionally deep recession, the SAAR recovered to the level that Ford and GM now say will put them back into the black in early 2011, long before other measures of the economy were "good." Both Ford and GM (and most, but not all, of their big global rivals) are well positioned for a downturn, whenever it happens. Both have low debt and big cash hoards that will help them keep product development going even if profits get squeezed. Both also have kept their dividend payments at levels they think they can sustain through a downturn. However, year-over-year profit gains may be scant (or absent) for the next several quarters, even if the U.S. light vehicle market stays strong for another couple of years. Investors look for earnings growth: That's why so many auto stocks fell 10% or more in January. That said, for long-term investors, particularly those reinvesting those dividend payments, a downturn need not be a big deal. Both Ford and GM have very good management teams at the moment and are fundamentally sound. I own both, and I have no plans to sell.